4/10/2009 — Sometimes a ride doesn’t go the way you plan. Sometimes a ride doesn’t go at all. The day before, I’d replaced the tire valve cores on both my front and rear tire. It seemed prudent advice from the community at Modern Vespa. My main concern was the rear tire, as that had been my issue the previous week. After pulling the cores and refilling the tire, everything seemed fine and I rode home. Today I needed to hop down to Bloomington to hand off the title to a car I’d sold about six weeks ago. For some reason, the fine state of Minnesota sent me the new title instead of the new owner. I geared up and wondered if the GT would start right away. In trying to chase down my starting issue, I’d unhooked the fuse once more to see if the bike would start normally. No dice. Had to trick start it yet again. At least my rear tire had air in it. I always do a “squeeze test” on my tires before I ride just to make sure there isn’t a fast leak. I try to do an actual pressure gauge check every 1-2 weeks, but I do the squeeze test every time I ride. It’s such an easy way to stay safe. I squeezed my rear tire and was relieved to find that it was still holding air. I set out and no sooner did I make that first left turn from my driveway did the rear end squish out something awful. My first thought was that I’d have to limp to the petrol station down the road. I gave the bike a little weave to confirm the squish. That’s when the tire completely came off its beads. At first I thought I’d run the tire all the way off the rim, which would surely ruin the rim. 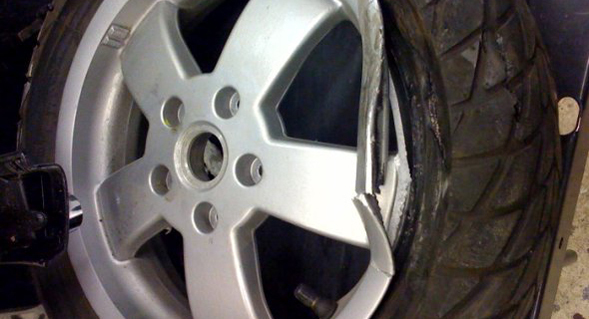 Thankfully the rubber was still on the rim and I was only about 100 yards from my garage. Epic journey fail though. Cue the MINI. Once my errand was run, I used my trusty bicycle pump to attempt to re-inflate the tire and heard the two beads clunk into place with some reassurance. I reluctantly rode up the road to the petrol station and like last week, the tire held air like nothing had ever gone wrong. I phoned Scooterville and they said to come on in and they’d get it sorted out. I rode over carefully, stopping here and there to affectionately squeeze my rear wheel. The verdict: a bad valve stem in the rim. Probably a $3 part that nearly wrecked me twice. My day of riding wrapped up with a Heck’s Angels group ride down Minnehaha Parkway with the Mrs and about a half dozen other riders. The tricky part with all this tire nonsense is getting my confidence back. It’s tough to tuck the bike deep into a lean when I don’t trust the rear wheel to hold. But as the ride wrapped up and we headed home, I started to feel zen about the GT again. I’m sure in the coming days that confidence and trust will return. Relaxing at IKEA for just a few minutes waiting for that title handoff. Such prompt and reassuring service from Scooterville. Getting the engine oil changed in the Mrs’ Buddy. Finally having this rear tire sorted out. But above all, seeing the destroyed Vespa rim in Scooterville’s mech area. Made my wheel issues seem pretty small by comparison. Watch out for giant highway potholes! Definitely the 100 yard walk of shame pushing my Vespa back down the hill to my garage. That and all the bad mojo in riding without being able to really trust the rear wheel. That just wasn’t fun at all.